Our self sufficient "Stand-alone unit V60" in the standard version is fitted with 4 non-exchangeable glass tanks – each with 10 sections and a limpid lid for each section. Water supply of each section in front side over single water-supply lines for flow control at each section. Drain over pre-filter pads at the back. Each of the sections is equipped with our convenient filter pad. 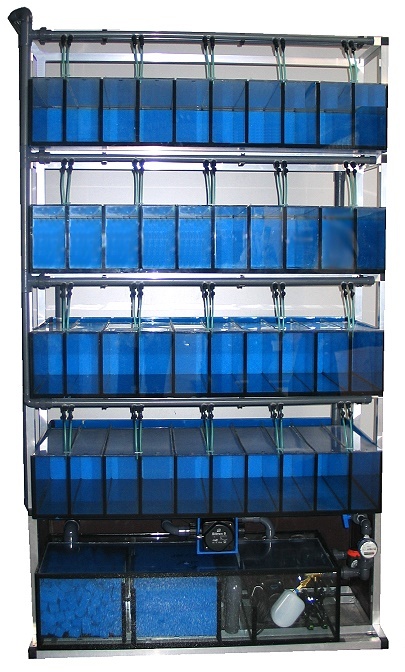 This filter pad benefits breeding and husbandry of each size of Zebrafish from embryos to adults. Further advantage is that food cannot flush out of the cabins; fishes may eat calmly. An installation of this unit by our mechanics is needed - please ask for an individual offer.